Amazon on Monday announced Kindle Textbook Rental, which will enable students to save up to 80 percent off the retail prices of textbooks, by renting them as ebooks from the Kindle Store, instead of purchasing them outright. It’s like a library—only one that you pay for the privilege of borrowing from. Amazon says that “tens of thousands of textbooks are available for the 2011 school year,” from textbook publishers like John Wiley & Sons, Elsevier, and Taylor & Francis. Students will need to choose a rental length—between 30 and 360 days—and pay only for the time they need a textbook. You can extend your rental in time periods as specific as a single day, or convert a rental to a purchase at a discounted rate. Students can continue to access any notes and highlights even after their rental period ends by visiting Amazon’s website. For an example of the potential cost savings, I looked at The Handbook of Journalism Studies . Amazon says the list price for that book is $265, and sells it in hardcover for $250 and paperback for $90. The Kindle edition is $64; the new Textbook Rental costs just $30 for 30 days. 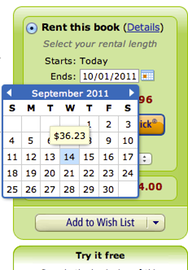 Amazon’s new interface for the feature includes a calendar pop-up that shows the rental price depending on the rental time frame you choose. Textbooks are notoriously pricey, and college students have long sought discounted means of acquiring them—buying used copies, for example. Amazon originally marketed its larger Kindle—the Kindle DX—towards students, because the bigger screen seemed well-suited to textbooks. But since there's no “used” aftermarket for ebooks, students often found that used paperback textbooks could be priced competitively compared to their Kindle editions. Kindle Textbook Rentals seems poised to flip that pricing problem. Amazon seems clearly focused on making Kindle books increasingly accessible; back in April, the company announced that it will launch the (free) Kindle Lending Library later this year. Textbook Rental books can be read on Kindles as well as via the Kindle apps for Mac, PC, iOS devices, and other mobile devices, too.